Its all about options at Clear Dollar Stamps! Hi friends! Its Katie here to welcome you to a Tuesday Tutorial. Just like my title says, I wanted to share a couple of cards that were made using different options that are available here on Lori's blog as well as from the store. If you recall or if you haven't seen it yet, Lori created a very handy stamp grid template to help you create the perfect stamped background...taking the randomness and making it easy. Well, I opted to use it for another purpose and for a different result. I also created the same type of technique and design using a fabulous new stamp set released for this month called Diamond Circle Background. Here are your basic tools that you will need. Next, all you have to do is line up each printed line with any of the grooves, just make sure you've got the same groove lined up... trust me, I've missed before :) Then just score away. Flip your piece over and voila a perfectly even scored background. Here is a sample I did using a white core cardstock. In this case, I already had this piece of cardstock cut and I just attached to a piece of copy paper and printed. Follow those lines and score away. Flip over, grab your sanding too and create another fabulous textured look. Here I grabbed my white piece and opted to ink my score marks with a creamy distress ink. My next piece uses the same technique, but I've opted to use the new Diamond Circle Background stamp. This is a fabulous and large image. The stamp measures a whopping 5" square. I opted to stamp a 4"x4" square for this sample. Stamp your image... doesn't have to be perfect for this technique. Use the same technique on your Scor-pal to create your scores. This grid will give you different dimensions compared to the free download... remember its all about options and choices. And now for a couple of finished cards for you. For this one I used the inked up grid from the free download and paired it with a set called Peace for the Journey and another New Release set this month called Marquee Labels. I wanted to let you know that my photo color is off and the cardstock I used was Ripe Olive which is a match for the velvet ric rac. For my last card, I used the piece that I scored using the large stamp as my guide. I paired it with this month's card kit stamp set called Daisy Flower Tag. Remember, this set can be purchase by itself or with several kit options. So there you go. 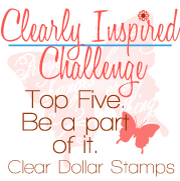 Thanks for joining me here at Clearly iStamp. I hope you have a wonderful day!